Are you wondering what the future value of a certificate of deposit will be? If that’s the case, this calculator has you covered. First use the rates menu to see current rates on offer. Then click into the calculator and enter the original deposit amount, the annual interest rate, and the number of months before you would like to claim your investment. Finish up by choosing a compounding interval from the pull-down menu. Click on CALCULATE, and you’ll see your CD’s future value and annual percentage yield (APY). You’ll also see how much money you stand to earn from interest. Certificates of deposit, or CDs, are a sound investment option when you have extra cash that you don't intend to use soon. Because they feature federal deposit insurance of up to $250,000, CDs are also a low-risk investment. They offer a more profitable alternative to letting your money languish in a checking account earning negligible interest. Additionally, CDs have higher rates of return than savings or money market accounts. The following guide covers everything you should know about investing in CDs, from their benefits to the kinds available. A certificate of deposit is a unique kind of deposit account that generally provides a higher yield than a traditional savings account. When you buy a CD, you invest a fixed amount -- typically $500 to $1,000 -- for a fixed period; terms can range from six months to five years or more. In return — when your CD matures — the bank pays you interest, which you receive in addition to the amount you originally invested. However, if you cash in your CD before it matures, you will likely have to pay early withdrawal penalties, which can be severe. When you cash in the CD before the term is up, banks are more limited in how they can invest your money, and they pass this cost on to you in the form of early withdrawal penalties. In deciding whether a CD is right for you, consider your investment time frame. First, determine when you'll need some or all of the money you want to invest in a CD. In the event of an emergency, do you have other funds you could tap into? If you don't expect you'll need the cash for at least six months, a CD might be a wise choice. For example, if you are saving a down payment on a car you plan to buy in a year, a CD is ideal. Consider interest rate trends to decide on the ideal term for your CD. If interest rates are climbing, choose a shorter-term CD, so you aren't locked in to a lower rate. If interest rates are falling, choose a long-term CD, so you lock in the higher rate for the CD's term. Most banks offer different types of CDs to accommodate varying needs and investment goals. We've summarized the six most common kinds of CDs below. Traditional CD: The bank will pay you a fixed interest rate over a specified time period. When the CD matures, you can cash it out or roll it into a new CD. 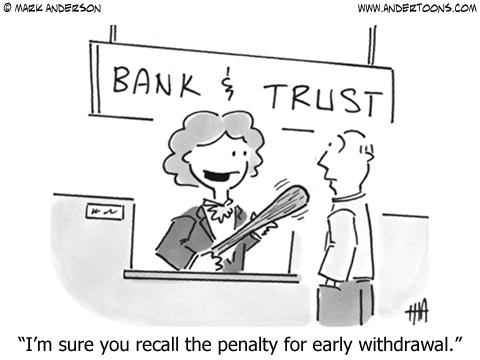 If you withdraw money prior to the maturity date, you might face stiff penalties. Bump-up CD: This CD is a good option if you expect interest rates to rise in the near future. With this type of account, you can exchange your CD's interest rate for a higher one if the interest rates on new CDs with similar terms increase during the life of your CD. Typically, banks allow you to do this once during a CD's term, and the new rate then remains fixed for the remainder of the term. Callable CD: Banks reserve the right to call back callable CDs, in which case they return your original deposit and any accrued interest. This usually happens when interest rates drop substantially below the CD's original rate. To reward investors for assuming the risk of having their CD called back; callable CDs tend to offer higher initial interest rates. Liquid CD: This CD offers more flexibility than a traditional CD, allowing you to withdraw a portion of your deposit without a penalty. In exchange for this liquidity, liquid CDs offer slightly lower interest rates than traditional CDs, but the rates are usually still higher than those of money market accounts. Brokered CD: Any CD offered by a brokerage house falls into this category. Brokerages can access the CD options of banks across the country, including e-banks. Because brokerages must compete at the national level, brokered CDs tend to offer higher interest rates than those from banks and credit unions. On the downside, investors must pay a fee to buy the CD. Zero-coupon CD: Instead of paying interest out annually, a zero-coupon CD re-invests the payouts so you receive interest on a larger total deposit. These CDs have somewhat higher interest rates, but you will be taxed on the re-invested interest. In addition to selecting the right type of CD, you'll also need to choose the best investment approach. Laddering, barbells, and bullets are the three most popular CD strategies. Each is explained below. Laddering: This approach mitigates the drawbacks of CD investment by allowing you access to some of your deposit and buffering against rising interest rates. Laddering involves dividing up your investment into several different CDs of various terms -- one year, two years, and three years, for example -- so a CD is always about to mature. Short-term CDs give you liquidity, while the longer-term CDs yield better rates. Bullet: The bullet strategy involves buying CDs that all mature at the same time. This approach is ideal if you have a major cash outlay on a specific upcoming date. Barbell: This strategy involves buying CDs of only short and long terms, passing on medium-term CDs. Investors who can't find attractive medium-term CD rates favor the barbell strategy. First, make sure you know your interest rate, including whether it's fixed or variable, and how often you'll be paid interest. Second, ask what the penalty will be if you withdraw some or all of your deposit before the CD's maturity date. Finally, remember that most CDs automatically renew, which means banks will roll them into a new account automatically unless you tell them otherwise. If interest rates are low or if you need the cash at that time, automatic renewal will hurt you. Find out what you need to do and when to opt out of auto renew. If you need a low-risk, fairly short-term investment, CDs are a simple, smart option. Choosing the right term and type of CD, as well as the right CD investment approach, will result in solid returns with very few drawbacks.